I’ve come to the conclusion I really need a design wall. There was one in my old sewing studio, and when I’m too close to a project, I don’t SEE it. That might sound peculiar, but when a person is too close to a work in progress, they miss seeing the overall impact. After all, most quilts are not meant to be viewed at a distance of 22″ – I measured the distance from my cutting table surface to my eyes. I’ve been using work arounds such as a long distance viewing lens, and taking photos then uploading them to my computer, with varying success. I keep on losing the long distance viewing lens – it’s small, and it takes a lot of time to take photos, upload them, view them, move a piece of fabric, take another picture, upload it, view it, rotate a piece of fabric, take another picture, upload it, view it, yadda, yadda, yadda. A design wall would be a more efficient way to work, and as my doctor kindly reminded me Monday, I’ll be turning 60 this year. I don’t have time to waste, so a design wall shall be moved into my new sewing studio ASAP. It’s freshly painted, so I won’t be pinning anything directly into the drywall. I’ll use a piece of lighweight siding insulation, cover it with felt or flannel, and lean it against the pristine wall. It won’t be as large as my other design wall, but it will work well for small projects. 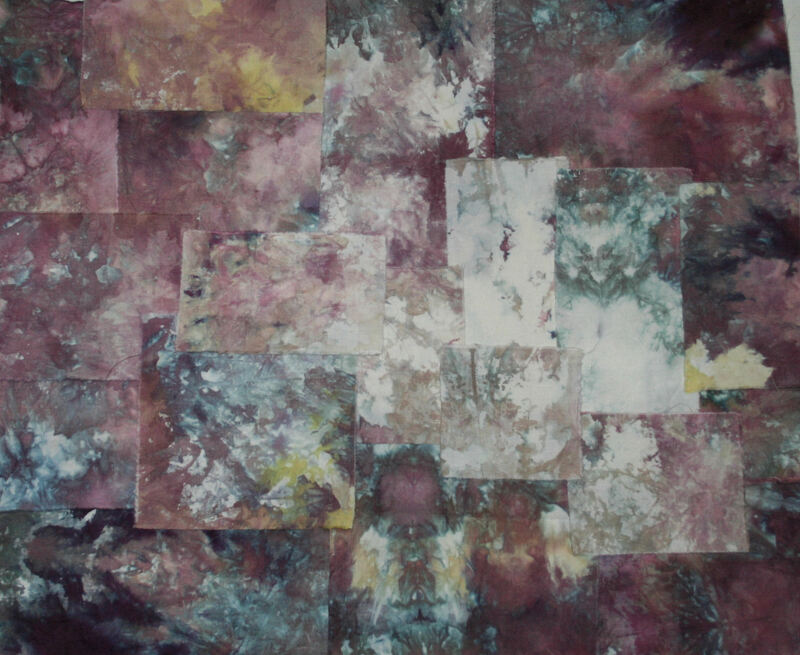 This year, I had the opportunity to sign up for an internet Art Quilt Workshop taught by Ellen Lindner, and am thoroughly enjoying being in her class. I’m learning a lot, and can’t wait for Lesson 2 to be posted later this week. 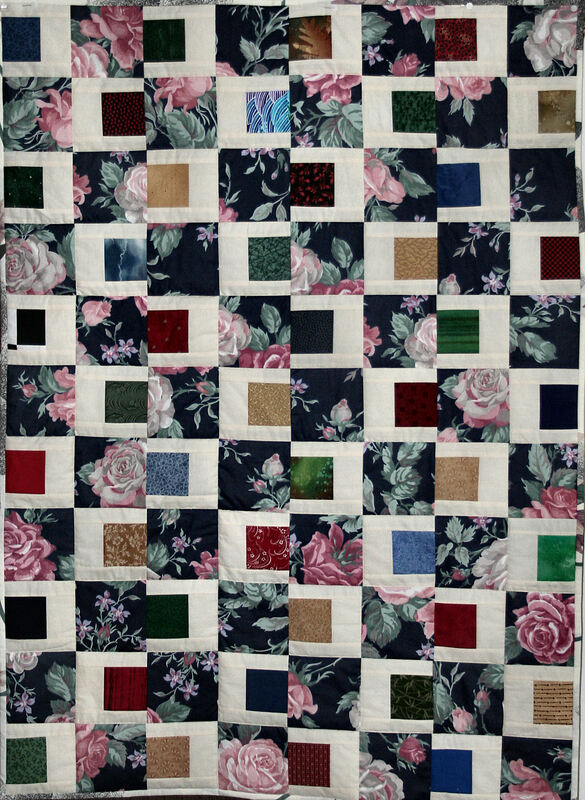 My local quilt guild asks members to make and donate quilts to be passed out in the community as needed, and this most recent one was an adapation from a quilt block on Melody Johnson’s blog. I was pleased with the layout and someone will now be warm and cozy. This was my first time using June Tailor’s Quilter’s Fusible Batting. 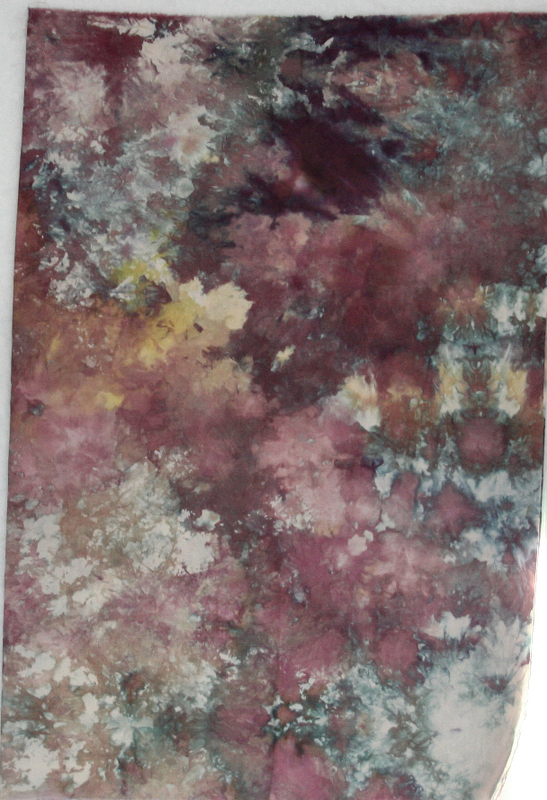 I am not a big lover of fusible battings, but hadn’t tried this one yet. It would not fuse for me on the suggested wool setting. I raised my iron’s heat setting, and the fusible discolored one of the muslin pieces. After replacing the piece and turning the iron’s heat setting back down, I decided fusible battings and I just don’t get along. Way too many areas didn’t fuse, so I ended up pin basting a lot of the quilt anyway. This really didn’t save me any time at all. Plus, I had to go and buy a big package of this, so my next 3 comfort quilts will also have this as the batting. I most likely will just pin baste them, and skip the frustration of trying to get it to fuse. It was fine for quilting though. The sewing machine needle didn’t stick in the fusible at all, so that was good. It should wash well and hold up well, but it’s not a batting I will purchase again. Yet another “new to me” batt came home with me last week too. This one is Quilters Dream Cotton. After being unhappy with the big batt, I thought I’d better purchase a smaller sized one this time. The minute I got it home and opened it up, I realized I should have purchased a BIG batt. Isn’t that how it always goes? You end up buying a lot of something you’re not crazy about, and a little of something that you’ll most likely love. It feels wonderful, and I can’t wait to sandwich this, and make a quilt with it. I’ll let you all know what I think of it as soon as I do. I almost forgot to give my yearly update of how my house destashing is going. Regular blog readers might remember that I’ve been trying to organize my creative work spaces, and my entire household, since 2005. The knitting/computer studio was so packed full, that there was a path in the room, and that was the only floor space available. My sewing studio had over 50% carpet visible, but there were stacks of fabric all over the place. I’m proud to say that another 150 pounds of fabric, yarn, books, and other supplies found new homes in 2010. That brings my total “poundage out of here” to 2,505 pounds! Can you see me doing a happy dance? And now I have lots of floor space where I can really strut my stuff! Being an eternal optimist, I’m oh so proud of myself, but the reality is there is not one empty shelf in the house, the closets are jam packed, my game room is still being used as a storage area, and there is still a long way to go. My slow but steady approach is going in the right direction, and it is stressfree, so I really don’t care that I have lots more to organize. When the mood strikes, I tackle an area. When the mood goes away, I forget about it. Obviously I’m immune to peer pressure. I merrily put on my blinders and ignore the game room. My sewing studio is the cleanest it’s been in 30 years, so productivity has increased. It’s very easy to locate my supplies, because I know where everything is, and there is lots less to move to get to what I need. Seriously – not that I get all that serious often – the only reason I started destashing and organizing, was because I realized I was wasting time looking for my supplies, and a dear friend of mine went through a horribly traumatic relocation. No way would I ever want to go through what my friend did. It’s oh so nice to be able to open a drawer and know my metallic threads are inside. My Ikea rolling carts hold lots of my lovely fabric, and all my stabilizers. And on, and on, and on. For me, organization helps me be more creative, and waste less time. I’m not getting any younger, and neither is my fabric collection, so the less time I spend looking for something, and the more fabric I use, the happier I am. 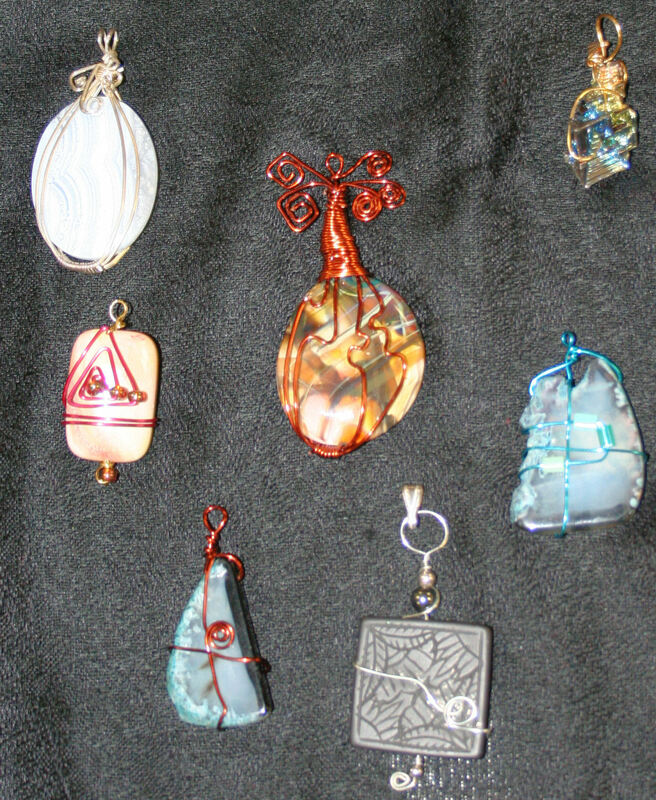 Yesterday was RAFA’s monthly meeting and I didn’t arrive in time to see the morning’s Show and Tell, but was in time for the wire wrapped stone/bead demo led by Varda. First off, you need the proper tools. Everyone shared, so I can’t use that as an excuse for not liking my wrapped bead. I was being a stubborn headed Calabrese though by trying to use a 20 gauge colored wire from JoAnns. Trust me. It’s works much better if you use the good 21 gauge, half hard, square wire that Varda suggested. Plus when you get a good grip with your tools on the colored Darice wire, the color comes off. 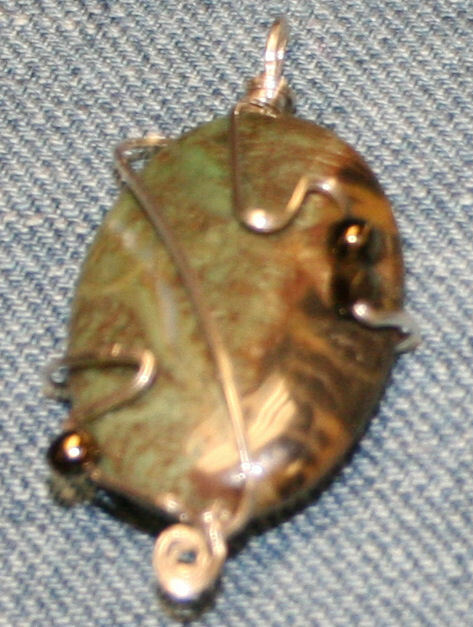 In my defense, the black wire would have been lovely against the stone/bead if it had stayed black. I took lots of pictures of everyone’s beads, but the bead’s shiny surface bounced the flash right back to the camera lens, so most of the pictures came out terribly. 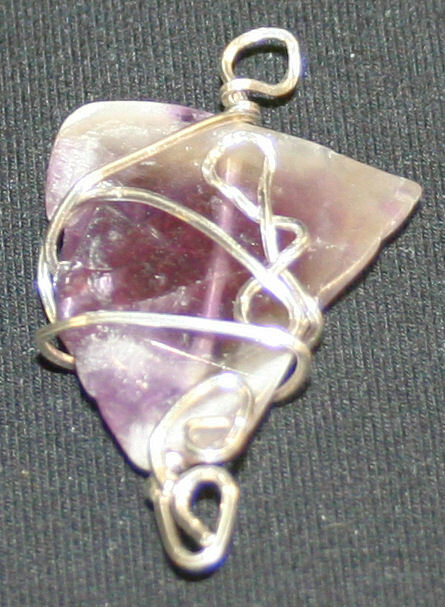 Even using the flash fill adjustment in Paint Shop Pro didn’t help much, so I only have 2 pictures to show. I chose them by clarity alone, so I apologize to Liz, Mary Louise, Glynis, Val, and Donna for not being able to post pictures of your lovely work. Happy New Year everyone!!! I hope you all had a wonderful celebration and, will have a happy and healthy 2011. This is the time of year where people make resolutions and start fresh. Well, that’s not the way I roll. I used to make them, and break them. I used to think everything would be a brand new beginning, but then I realized I’m happy with how things are now. I don’t need to start fresh, and I pretty much stay on track, so I don’t need to make resolutions. Now I just spend the first day of a new year doing everything I love doing, and eating everything I love eating. Nothing like keeping it simple. 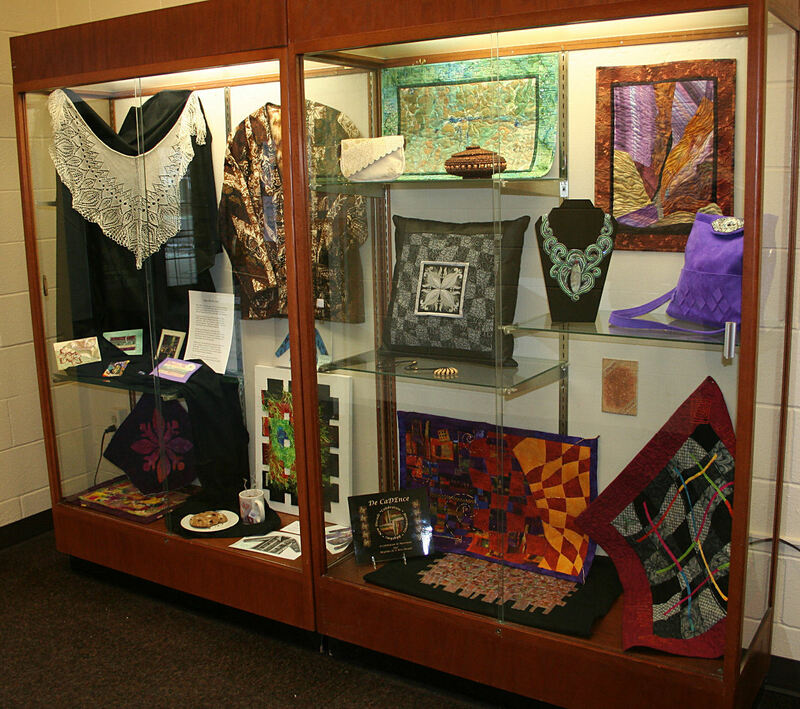 Today, I got together with my fellow Ogden Art Group members and we filled the display cases in the Ogden Farmers Library. What fun we had. It was wonderful seeing what everyone brought and the 2 cases look darn good, don’t you think? It turns out one of our members was a professional window dresser. I’ve know this woman for 15 years or so, and never knew she had that in her work experience. Another member has arranged the layout for the GVQC quilt shows for years and years, so we had lots of good advice at hand. I knit the lace shawl in the upper left corner, and am so glad I brought a bolt of black fabric to use as a backdrop. I brought a tension rod so it could be hung from that, but Karen or maybe it was Janet, suggested draping it in the corner, and that worked wonderfully. All the fabric postcards on the black fabric are mine too. And there is a tiny little piece of crazy quilt embroidery nestled into that montage. I can’t forget my love for crazy quilting. The jacket next to the shawl was Janet’s work. She also had some pictures of other jackets she had made on commission. She does a beautiful job with her art to wear clothing. On the bottom left are a couple of Pat’s pieces. And the cookie and coffee are Margaret’s work. No, they are not real. That steam coming off the coffee is a really neat effect though. If you double click on the photo, it will enlarge for you, and hopefully you’ll be able to see the steam. Next to that is my hamster cell piece. It’s mounted on a white canvas and was turned sideways so the display would look balanced. 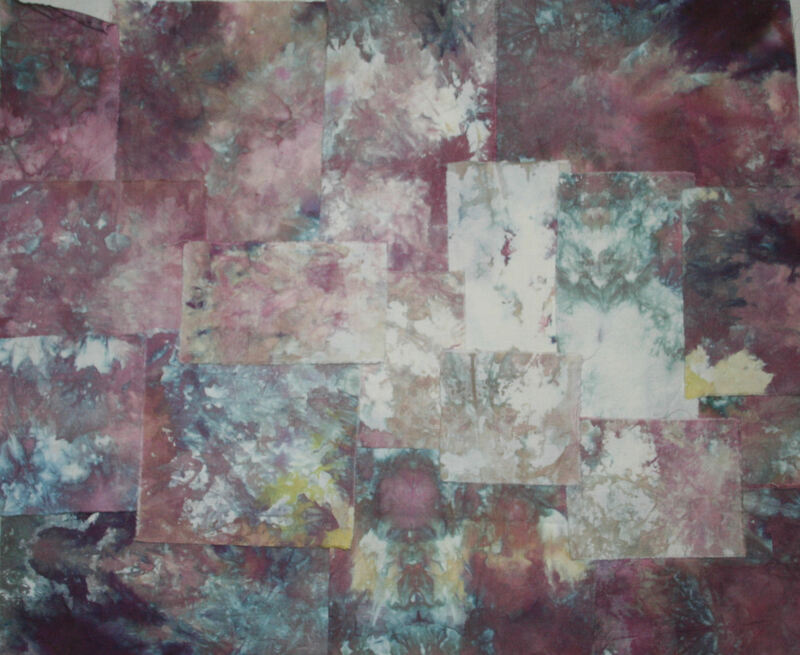 The next case has 2 quilts by Pat – the aqua one, and the one with rust and purple. On the same shelf as the aqua wall hanging is a lovely embroidered clutch purse by Lucy, and a beautiful coiled basket made by Karen. Below the rust and purple quilt is a drop dead gorgeous beaded necklace made by Karen and an elegant purple purse by Lucy. The middle shelf has a silver and black pillow – another of Lucy’s creations, and a black and gold beaded knit purse made by me. The bottom of the case has a book I brought from last year’s Decadence exhibit. The 2 quilts against the back of the case are included in the book. The one on the left was made by Karen, and the one on the right was mine. The quilt laying on the bottom of the case was another of mine. It was in the Blank Fabric Challenge a couple of years ago and was re-designed. That’s another term for ripping it apart and reconfiguring it. I much prefer this variation than the one I entered in the show. 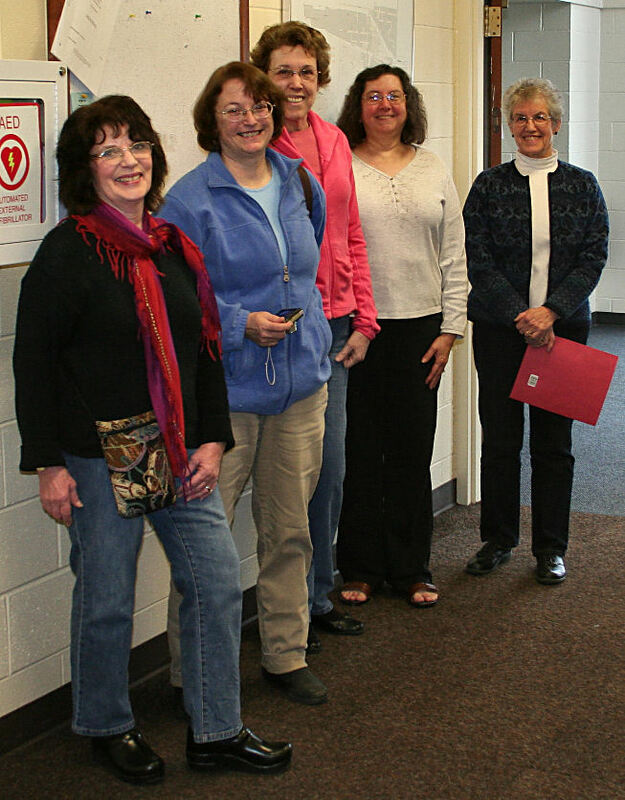 From left to right – Pat, Karen, Lucy, me, and Janet. Margaret had to leave early, so missed the photo op. And a big thanks to my husband who took the picture. He drove me so he could drop me off at the door, and I wouldn’t have to walk in from the parking lot. He’s a good soul. Notice I’m wearing summer sandals, in Upstate New York, in the middle of winter? No, I didn’t get my Christmas wish – I had wished I could wear shoes for Christmas. Heck, I’m still not wearing socks, but I am walking without a limp, and my toes are healing nicely. Hurrah for that!! !